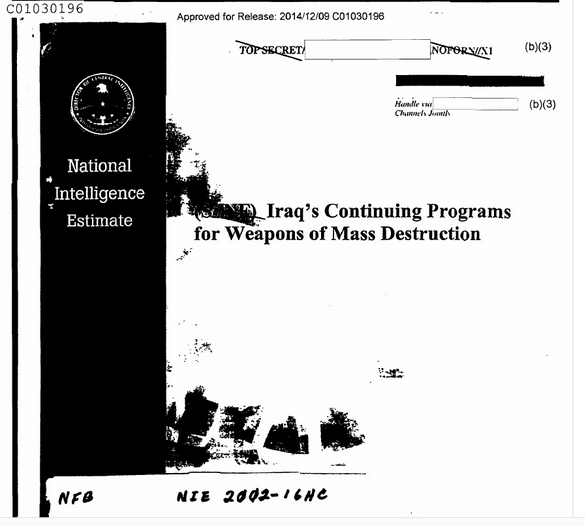 Thirteen years ago, the intelligence community concluded in a 93-page classified document used to justify the invasion of Iraq that it lacked « specific information » on « many key aspects » of Iraqi President Saddam Hussein’s weapons of mass destruction (WMD) programs. Congress eventually concluded that the Bush administration had « overstated » its dire warnings about the Iraqi threat, and that the administration’s claims about Iraq’s WMD program were « not supported by the underlying intelligence reporting. » But that underlying intelligence reporting — contained in the so-called National Intelligence Estimate (NIE) that was used to justify the invasion — has remained shrouded in mystery until now. For the first time, the public can now read the hastily drafted CIA document [pdf below] that led Congress to pass a joint resolution authorizing the use of military force in Iraq, a costly war launched March 20, 2003 that was predicated on « disarming » Iraq of its (non-existent) WMD, overthrowing Saddam Hussein, and « freeing » the Iraqi people.